Blog Whose Purée Is it? There are approximately forty medical reasons for the condition of dysphagia (or swallowing difficulties) that call for the patient to begin eating a regimen of pureed food. I have detailed the conditions in Essential Puree. The CDC says that one million people a year are diagnosed with the condition. According to the CDC, 15 million people in America have a swallowing disorder. That is a lot of people. There are many medical specialists who treat these patients. Most swallowing disorders come about through neurological disorders related to aging: Alzheimer’s, dementia, Parkinson’s, stroke. some are related to disease; and some are related to accidents: motorcycle, automobile, boating, sports and industrial accidents. Some are related to paralysis and disability. Some are related to digestive disorders. Some are temporary and some are permanent. These condition are not related to age, but may occur at any time of life. It is tragic to think of losing one of life’s greatest pleasures, the pleasure of good eating. In my mom’s case, dementia related to age was the cause of her swallowing difficulty. War injuries are of many kinds and are often overlooked. I had a letter from a young serviceman returning from a war zone. He had been shot in the neck and could not eat solid food. 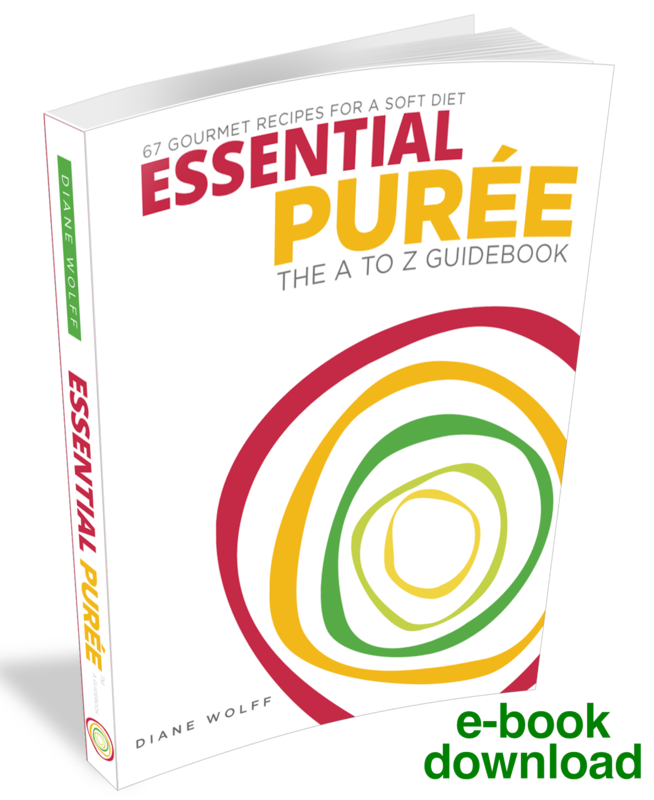 He ordered a copy of Essential Puree: The A to Z Guidebook and he began making the recipes and feeling better from nutritional healing, he was happier. The designer in the print shop who created my letterhead told me that her stepson had been in a motorcycle accident and needed to eat pureed foods. She bought a copy of Essential Puree for him, hot off the presses. The maitre d’ at a restaurant where I attended an alumnae event told me that his sister needed the book because she was in chemo for cancer treatment. These are people who need puree because of illness. But there is the health and fitness crowd who desire pureed foods by choice rather than necessity. These people who are trying to improve their health by losing weight, detoxing and cleansing or just plain trying to control their food in a fast food world. The manager of my whole foods store recommended the cookbook to someone who had gastric bypass surgery as a means of getting control of obesity. He used the cookbook to get him through the post-op period. This same manager told me that many people with digestive issues seem to have an easier time with pureed foods. Take note: Healthy people may have a reason for wanting pureed food. The very talented guy who did physical therapy for my mother had extensive oral surgery. He couldn’t eat solid food. He had a copy of the Guidebook and he made pureed meals. He was grateful because he had originally been drinking fruit juices and he was starving. My banker saw a copy of the book and told me he wanted to lose weight. He wanted to escape the fast food and vending machines at his bank, a branch in the suburbs. He liked the fact that the calorie and nutrition count per serving were provided. He was watching his food intake. He was heating up the meals in the microwave in the bank’s break room. He told me proudly that he had lost ten pounds. A friend of mine had a plastic surgery procedure, a facelift, and could not eat solid food for a week. She got the Guidebook; she made the pureed food and drank it through a straw. It got her through the post-op period. Another friend of mine is a mother with children in grade school. She is always on the run. She thinks of the Essential Puree blended meal as a smoothie of rocket fuel. She can take it with her and sip it in the car. It beats the fast food joints. She can even take it to the gym, so she has a protein supply after a workout. She thinks this is better than downing a protein sports shake that solves the protein problem but is unsatisfying to her. An investment banker friend of mine is always taking a plane to some far corner of the world. He grew tired of eating airplane food, airport meals, and take-out food from delis. This man had been eating in five-star restaurants all over the world and was familiar with the pureed vegetables that top chefs had been serving as side dishes. He liked the puree. He thought he could bring pureed food in a portable container and he found out about the airline regulations: three 3 oz. containers were allowed by TSA regulations. He brought the food in the approved containers in a zip-lock bag. The covered containers had good seals and did not open in his briefcase or his carry-on. For the road warrior in him, the pureed meal was a salvation. The new routine saved him mental energy—he did not have to think about getting food in airports. It was also a time-saver. He knew the food was high quality, scrumptious and had the virtue of being clean eating. He had control of his food. In other words, perfectly healthy people might choose to eat pureed foods for reasons of convenience, health, and fitness.